Artist Neil Carroll will replace Lili Heller from the 22nd of January until May 2019. Neil is a former TAW instructor and a very talented artist. He is currently doing a residency at IMMA and is highly knowledgeable about painting techniques. He will be conducting both Tuesday Watercolour (and Gouache and Acrylic) classes, from 4 to 6 and from 7 to 9 pm. Classes will resume 22 January 2019 until May. Classes work on a drop in basis and so there is no need to book places! Trinity Arts Workshop Studio, 191 Pearse Street, Dublin 2. Suitable for complete Beginners to Intermediate and Advanced. Come and practice, learn quickly, improve each time, push the techniques and the experimentation further and enjoy.Fundamental subjects based on observation. Figurative painting is explored (until reaching limits with abstraction). Exercises are based on nature, landscape, colours and contrast comprehension. Diverse gesture experimentation for varied effects. Colour mixing, shade and contrast techniques showed and explored. Individual support is provided (respecting each person pace and subject choice). Collection of various images / objects are supplied as bases to work with. Supplies provided. (You can bring your own material too). Friendly and engaging atmosphere. Hi is the watercolor class still taking place?up until what date? 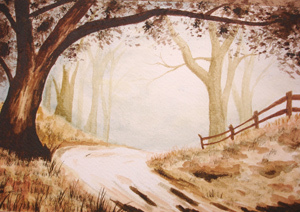 The watercolour classes have ended along with other classes for this academic year and will resume in September. There are no more watercolour classes this month (December 2017). 1st classes will be on the 9th of January. I was unable to find the workshop despite asking several students and staff. Could clarifying directions be added? Hi, I am looking for paiting (watercolour and acrylic) classes in Trinity. Could you please provide me details how to register for classes and the material to bring in ?